I got this book simply of the fact i am addicted to Andy McNabs work and i want to read all this books! Kevin Dodds works in a bank where he is bossed around by his boss, go goes homes and leads a dull and boring life. He craves adventure and excitement but all his friends see him as the Grey man with no excitement! One day when his boss wont let him have the day off to celebrate his wedding anniversary everything changes! Sick of been pushed around Kev goes for his most daring move yet..... he is going to rob the bank! Putting his plan in motion based on all the action movies he's watch Kev is ready! 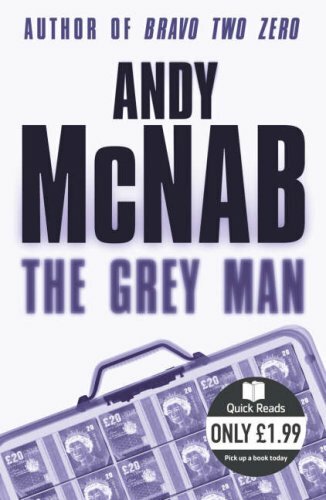 will he succeed or walk back home the grey man? This was a fun little short story, not McNabs best work but nice for little read! I loved the little bits of the story of what his routine was, how his wife made him listen to fashion things. I liked the fact that he stood up for himself in the end! And he finally got his excitement!